Best Water View in Cape May! Enjoy spectacular sunsets over the beach and Delaware Bay, with an unobstructed 180 degree view to the horizon! Watch the dolphins play from the comfort of your own deck! 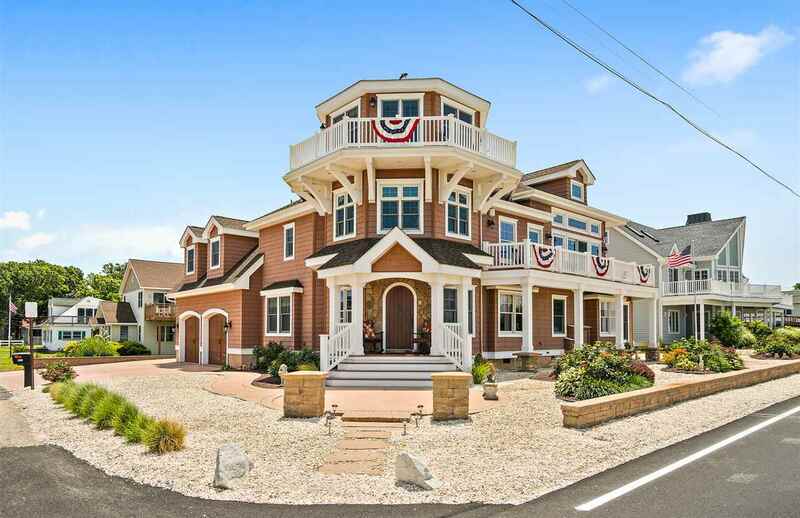 Designed by premier Zacker Group of Avalon, this custom-built home offers water views from three floors, every room and deck. Built for luxury, comfort and low maintenance inside and out, this three story, four- to five-bedroom, three bath, âupside downâ design maximizes the views from each living area. Enter this home into a sophisticated stone tiled foyer area.This level offers two lovely guest bedrooms currently used as his and her offices that share a stylish tile hall bath. A spacious master bedroom with two large closets and a gorgeous bathroom is skillfully located to have privacy and capture the views and bay breezes. There is a private sitting room/ all-season sun porch with wet bar that opens to deck and the yard adjacent to the master bedroom. Gorgeous 5" wide plank Maple hardwood flooring, rich trim package, recessed lighting, decks galore and outside living spaces all add to the appeal of this magnificent home. The second floor offers a dramatic open living, dining, kitchen floor plan with vaulted ceilings and a custom built American Cherry wood fireplace. The kitchen is finished with custom Cherry Cabinetry, granite counters, natural stone backsplash and stainless appliances. There is a charming guest bedroom, tasteful hall bath, delightful turret room surrounded by windows (used as a gym) and two additional very large bedrooms currently used as an art studio but would be an ideal second master bedroom suite. The third floor offers a fabulous turret room with wet bar and panoramic views! This home could easily have an elevator and pool added if desired. Beautifully landscaped grounds, and resort-like hardscaping with a gas firepit, are designed for outdoor entertaining. So many extras: large super dry basement, 2-car garage, underground drainage and sprinklers and so much more! Built to exacting standards by Zeigler-Ranalli Development of Avalon, this home has had no expense spared in its construction. See associated docs for more info: Amenities list, survey, expense report and sellers disclosure. We also have many more pictures. Ask and we will email to you or your agent. Schedule your private showing today!